Is the agar wood investment plan real or scam? 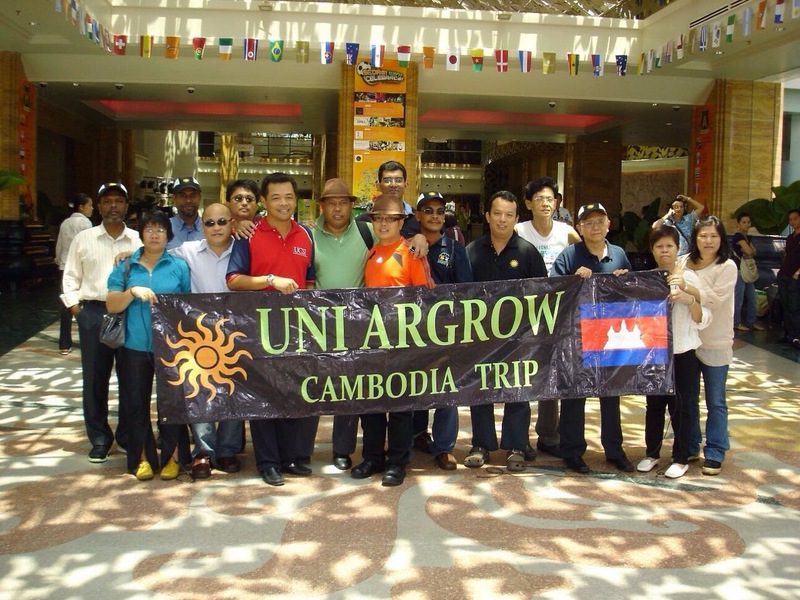 Dr Nixon Yap 葉金標博士 the CEO of Uni Argrow (M) Sdn Bhd and Uni-Argrow (Cambodia) Ltd. Bhd. The investors reported to police and other government agencies like Bank Negara but none of them managed to get back their money. They show this picture to give the investors an impression that the Cambodian Plantation did exist. 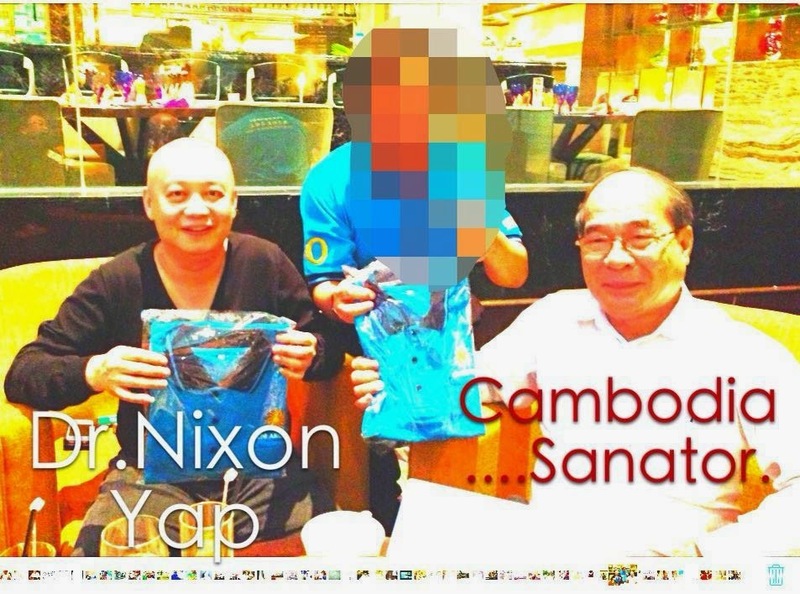 Dr Nixon Yap (left) and Cambodian Senator HE Chhit Kim Yeat. Raja Izan, the person behind Unicap Asia, the hedge fund company supposed to manage the fund of the Uni Argrow investment Plan. 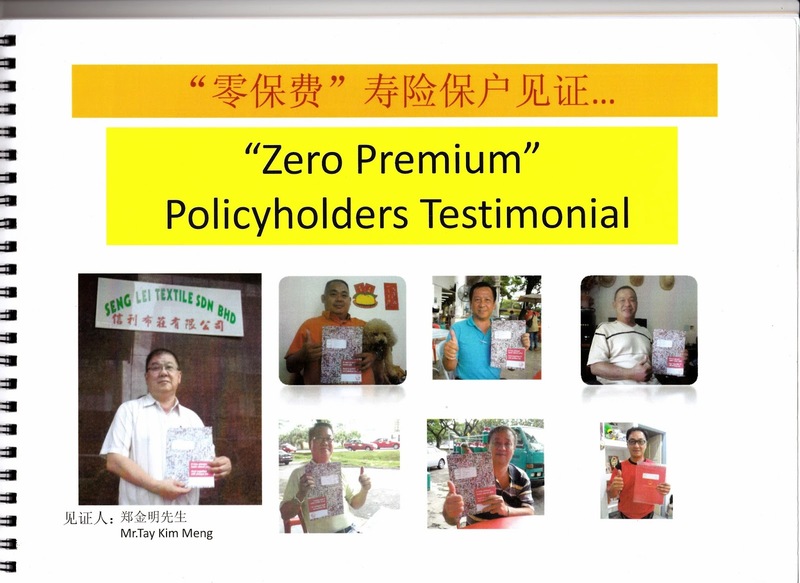 The marketing strategy : Zero Premium Plan that caused a lot of investors took out their insurance money and invest in this plan. The Uni Argrow factory in Damansara was flourishing in the beginning of the plan but closed down after a few years of operation. 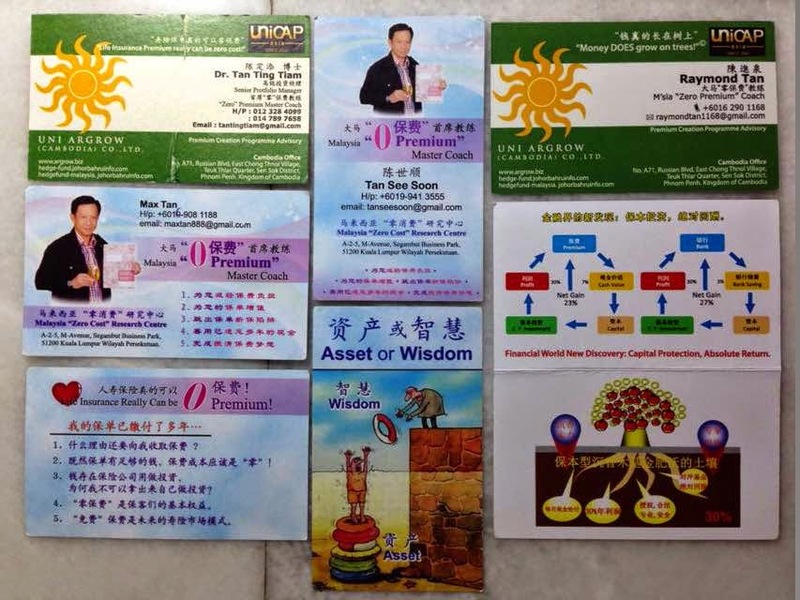 A pamphlet on Unicap Asia. 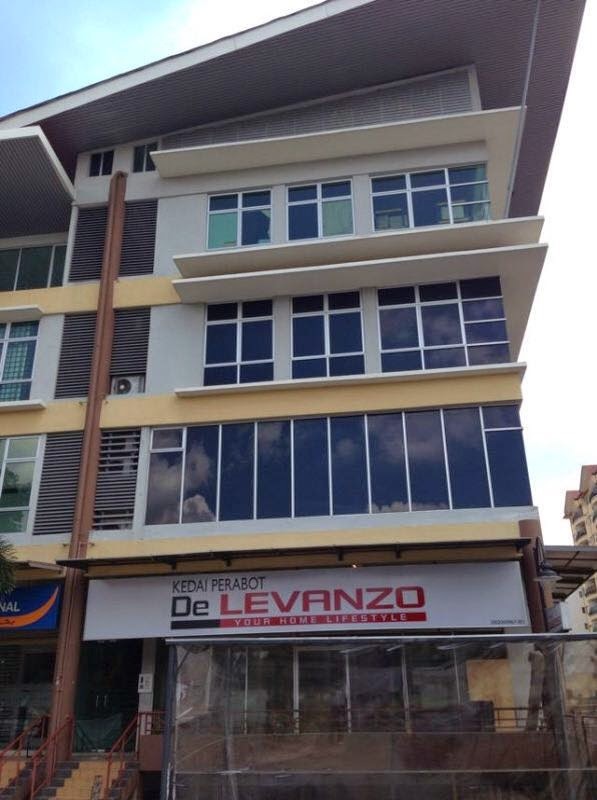 This is the office of Uni-Argrow Plan, Segambut, Kuala Lumpur. MEMORANDUM OF UNDERSTANDING GIVEN TO DR. NIXON YAP, THE CHIEF EXECUTIVE OFFICER OF THE UNI-ARGROW SERIES 0809 BY UNIARGROW INVESTMENT SETTLEMENT AD HOC COMMITTEE ON 18 AUGUST 2014. 1. We understood from the beginning that you are going to pay out 30% of the principal as dividend yearly and that upon expiry of the 3 years investment period the principal will be refunded. This has been the major selling point of this Plan and such was preached in all the sales talks and power-point presentations. But from December 2013 until now, even though the dividends were still credited to our respective accounts, they were not able to withdraw to our bank accounts. Only figures were shown but withdrawal cannot be realized. Some of us has accumulated as much as USD50,000 in their accounts. 2. Also, some of us who have matured investments when asked for refund were not heeded. 3. We also understood that some of us signed up as Portfolio Advisors and when we brought in the business for you, they will be paid certain amount of commission or bonuses. We have seen the commissions or bonuses credited to our web account but just like the dividends, were not able to withdraw to our bank accounts since December 2013. 4. We were told and understood that this investment plan mentioned above is protected by a Latin American Private Interest Foundation and that a Latin American Foundation known as Latin American Foundation was appointed by you to act as the custody of all Joint Holdings Partners’ accounts, but during the past nine months or so we were not contacted by any Latin American Private Interest Foundation to inform us of the financial and our account situation. Moreover, you have previously put up some write-up about Latin American Private Interest Foundation on the official website, but this was taken down completely, not a word about capital protection remains. All these was done quietly neither have you informed us nor does you announce it on the website as why you took such an action. Therefore you has caused fear and worry among us, and generally we look at this way: the investment has collateral protection in the beginning but now it does not have the protection any more. 5. In the Agreement you stated that you will maintain a Holdings Account on the investors behalf at the Latin American Private Interest Foundation for the safe keeping of the investors’ Holdings, if this is so why you did not pay out the refund when the investment expired and we requested for refund? 6. Moreover, during the beginning of August 2014, you have taken a drastic step to close down many of the investors web accounts without giving any reason. Since you have not given any reason we will explain the matter as our investment has become invalid and that all our investment moneys were forfeited. This has caused a deep sense of worry and anger among the investors. 7. 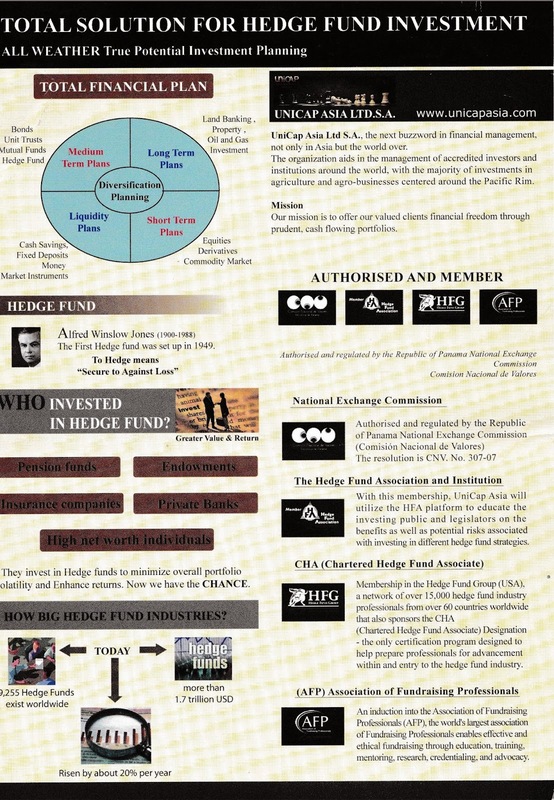 When this Plan was newly launched, you mentioned that Unicap Asia was appointed to be the Fund Manager of this plan, but later on, the name Unicap Asia was removed from the list of Hedge Fund Association, and then from the official website home page even though Unicap Asia logo is still there, but the link to the site of Unicap Asia is broken. Initially we made the decision to invest in this plan is partly because we trust that Unicap Asia is a licensed hedge fund company and possess money taking license, later on if this condition is no more valid we should be given the choice to choose whether we still want to keep our investment or otherwise. You should have notified us of the change but this was not done. 8. And on the 16th August 2014, you have gone one step further by suddenly and without prior notice, taking down the website (url: http://www.argrow.biz/Member/index.aspx) which is the platform for transactions to take place, where our investment history recorded, transaction accounts shown, and all our dividends and earnings tabled, and also from which we can withdraw our dividends and Portfolio Advisors’ bonuses to our bank accounts. 10. We want you to refund ALL THE INVESTMENT MONEYS we have invested into this plan and pay out ALL THE DIVIDENDS as well as ALL OUR EARNINGS as PORTFOLIO ADVISORS accrued so far, thus terminate all our Agreements with you. We have no trust in this Plan anymore and will never recommend it to others. We do not want to accept any other settlement scheme besides this, but we can negotiate on the details of it if you agreed to this proposal. 11. We want you to reply us within 7 days from the date mentioned above by emailing your decision to the committee members of this committee as attached. 12. We urge you to take positive action to refund our investment and earn the hearts of one thousand men and women who were once your staunch supporters, otherwise the future of this plan is in fact bleak and unpredictable.